Based on the reported amounts in and around the Castle Rock area, we would call the snowfall forecast verified. In most cases, the 3-7 inch range would have sufficed as well. Even though the dry nature of the snow will limit moisture, we still got much more out of this storm than we have with any of the storms we’ve had this year. Sadly it looks like another drier period is beginning after this storm exits the region. I did some digging, Castle Rock has not seen this much snow since April 17, 2016! 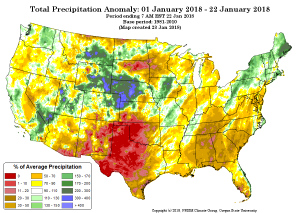 The latest round of snow moved some areas of Eastern and Northeastern Colorado into above average precipitation territory. Meanwhile the mountains are still very far behind! Hopefully we can squeeze a bit more snow out of the atmosphere as we move into spring and into our snowier months of March and April. Hope everyone enjoyed the storm!